Tyr: These aren't the old days. Dylan: Not yet, but I'm working on it. At the outset of Volume Three of Andromeda, I find myself at a crossroads. I can continue to complain about where the show fails (wasting a solid premise, resorting to sci-fi clich�s all too often, subjecting the viewer to often terrible dialogue), or I can enjoy it for what it is: namely, a somewhat mindless space action series with a fun cast of characters engaged in comforting, occasionally surprising, but never innovative adventures. Still, it would be easier to accept it as the latter if the series would abandon some of the pretentious spiritual and political overtones. Taken for what it is, a sci-fi show that is content to plumb the depths of sci-fi clich� in the name of entertainment, Andromeda isn't bad. 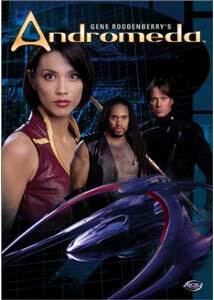 It's still hit or miss, but if you don't go in expecting something revolutionary or unique (like Farscape or the late, lamented Firefly), you'll likely have a decent time. This two-disc set includes episodes 11-14 of Season One. Harper: I don't know why you're so excited. All you and I ever get is junk. Trance: I know, and it's so great! Because you can buy your own moon, or you can make millions without ever leaving the comfort of your own home world. This episode starts off well enough with the crew checking the mail and discovering an old message for Beka... from Q! Well, really it's from Uncle Sid, but he's played by Star Trek: TNG favorite John de Lancie. Sid, an old friend of Beka's father, begs her for help, and she and Trance run off to rescue him, even after she learns that the message is three years old! When they reach the world from which the message originated, they find a population of drug addicts, addicted to a substance called flash, and they find Sid, but he's in a very different position than they'd expected. Truthfully, the story is extremely predictable, saved only by the zeal that de Lancie brings to the role. Major points off for stupid sci-fi standards like the inept henchmen and the anti-drug moralizing (a scene of Beka on flash is overplayed to the max, though it does result in a great line to Trance: "What's your deal? Why 'ya purple?"). The subplot of Andromeda facing space storms and sneaky traders is totally boring, and all filler. Every sci-fi show can be improved by adding a little Ingredient Q. 2.5 Andromedas out of a possible five. Here's an episode that takes some routine sci-fi themes and actually arranges them in a new way, offering up some surprising twists throughout. Dylan and Co. happen upon another High Guard ship, and it's the Pax Megellanic, Rommie's "older sister" (in a nice artistic twist, the ship is entirely made of gold-colored metal, so the Andromeda sets can be redressed and look a little different). When they go onboard, they are surprised to find the original crew still alive, unaged after 300 years. Their commanding officer, the beautiful Jill Pearce, believes their survival has something to do with the explosion of a nearby planet. A bond forms between Jill and Dylan while the rest of the Andromeda crew tries to figure out why the Pax's A.I. is no longer functioning�Rommie even "enters" her sister's mind electronically to find out what happened to make he shut down. And what she finds casts doubt upon the truth of the story Jill is telling. Mathematics of Tears? Definitely Calculus. 4 Andromedas. Tyr gets another showcase episode, and once again, I find the character a little too Worf for my tastes. On the other hand, Keith Hamilton Cobb is one of the better actors, so giving him screen time isn't necessarily a bad idea. In this utterly routine installment, Tyr, a Nietzchian, crash-lands on a planet that has been cruelly governed by a Nietzchian tribe for years. Plus, he has lost his memory, so he doesn't know if he is a part of the ruling tribe (he has TV amnesia, where he can remember general facts and history, just not himself). Two reluctant citizens come to his aid, believing him when he claims to be peaceful, but they soon become the targets of a group of Nietzchians hunting Tyr down for stealing a priceless ancient artifact. Though this episode provides some nice backstory for Tyr and his race, it is done in the most uninspired manner possible, and while the story is fairly entertaining, it never surprises or engages. This episode bangs the drum a little too slowly. 3 Andromedas. Harper: "Brae is aneapaire." Love is our language. Beka: No, actually, 'love is your sandwich,' but thanks for playing. The set ends on a strong note with this amusing Harper-centric installment. When Beka and Harper are out on the Maru, they encounter a strange being floating in an escape pod. The man gives Harper an electric shock, and then abruptly dies. Soon, the Andromeda is visited by a bounty hunter who claims that the dead man is his property. But what he really wants is information the man was carrying, information that has been downloaded into Harper's brain (along with millions of terabytes of additional data). Despite the "data runner" connections to Johnny Mnemonic, this is an interesting outing, as Harper's newfound genius allows the character to first become very productive, and then slowly go insane. There is also a hint at an overarching storyline involving a mysterious, shadowy figure that will hopefully pop up again sometime soon. Hey, Andromeda, William Gibson called. He wants his storyline back. 4 Andromedas. Extras Review: ADV has included another nice batch of extras with the third Andromeda release, though there is a bit less of substance this time around. Once again, extras are divided between the two discs. The latest in a series of text profiles is the Profile of Tyr Anasazi�a few text screens of character backstory, along with a brief interview with actor Keith Hamilton Cobb and some costume design sketches. There is another text bio on disc two, this one for executive producer Majel Barrett Roddenberry (wife of the late Gene Roddenberry, and the one who found the stack of notes from which the premise of the show was developed). There is an extensive text section that provides information about the galaxy's different life forms, and another glossary that includes pseudo-scientific terms created for the show (K-O). Disc Two's text extra is entitled Timeline of the Commonwealth: Growth and Peace. Both discs include deleted and alternate takes, though only a scant minute each. Both also include image galleries�the first, "Cast Shots"; the second, "Prop and Set Concept Drawings." The featurette Visual Effects is your standard look at the development of CGI visuals, from digital matte paintings to the ships in space. Unfortunately, it runs for less than two minutes, so you can imagine how in-depth it goes. There is also another Sorbo-centric blooper reel (though Rev Bem does get to do a nice little dance). Disc One has promos for the first three episodes, while the second disc has promos for episodes four and five. ADV previews are also split between the discs; all told, there are clips for Farscape: Season 2, Noir, Zone of the Enders: Idola, Samurai X, Excel Saga, The Devil Lady, and Neon Genesis Evangelion. The lack of a commentary with this volume lowers the grade a bit, but it's still a nicely produced package (though the animated menus get to be a chore). This picks up considerably following the lackluster Volume Two, but I still don't feel that Andromeda is reaching its full potential. It seems content to exist as a rather brainless sci-fi "action hour," and that's fine, I suppose. I just wish it was something more. Still, these four episodes stand on their own as entertaining adventures, and I can easily recommend a purchase to series' fans.